Doors are made in a variety of forms, and are classed under various heads, according mainly to their method of construction. Custom has, however, fixed upon certain doors, names indicative of either their use, position, or manner of hanging. 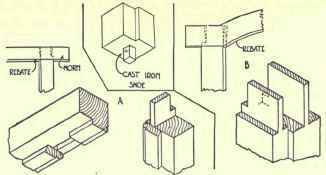 Doors are in most cases hung upon hinges or butts, and it is necessary to provide some substantial fixture for attaching the hinges to. It must be rigid, as, if not, the continual swinging and frequent slamming of the door will loosen it. External doors are always hung in what are known as "Solid" Frames. This means that the frame is composed of pieces of large section, such as 4 1/2 by 4 inches, and the term is used to distinguish between such frames and Casings or Linings, which are generally used for the hanging of internal doors. A solid frame usually consists merely of two Side Posts and a Head, the entrance step of doorway forming the sill. The posts are also sometimes called Jambs, although the term is more generally applied to the sides of linings. The posts are framed into the head with mortise and tenon joints, as shown at A, Fig. 108, and the ends of the head are left projecting about 4 1/2 inches beyond the posts, so as to be built into the walls. These ends are known as "Horns." When the posts rest on a stone or concrete step, which is usually the case, iron or slate pegs or "dowels" about 3 inches long are let into post and step. A better plan, however, and one which preserves the posts, is to fit castiron shoes, as shown at C, Fig. 108, on the ends. These are provided with a dowel to let into the steps. They may be had in any size, and moulded to suit the frames. Doorheads are sometimes made segmental, in which case, if the rise is slight, they are cut from a solid plank to the required sweep. If the curve is quick the head must be built up of two or more portions connected by means of hand-rail bolts. The posts are connected to a segmental head in precisely the same manner as with flat heads. When the posts and head of flat or segmental headed openings are greater than 5 inches in width, a second tenon is employed, as shown at B, Fig. 108. Semicircular doorheads are usually built up in two sections, one composed of two pieces and the other of three pieces cut to breakjoint, and screwed and glued together as shown in Fig. 109. The posts are connected to the head by means of a hammer-headed tenon joint, as shown in the Figure. When frames are built in it is advisable to leave a small air space between the back of the frame and the wall, otherwise there is the risk of dry rot being set up. Two tie irons should also be fixed to each post. These are pieces of flat iron, one end turned up at right angles and screwed to the post, the other end split and built into wall (see Fig. 110). Internal doors which occur in such positions as vestibules are also generally hung in solid frames, the framing being carried out to the walls and ceiling and filled in with panels or glass, as shown in Plate IV. The linings for internal doors are of several kinds. 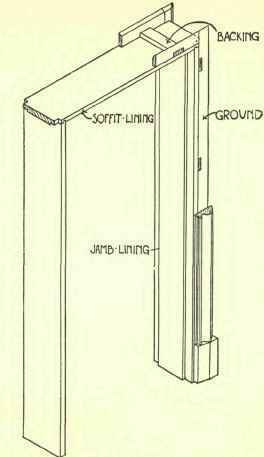 A "Set of Jamb Linings" consists of two sides or "Jambs" and a head or soffit lining. "Plain" Linings consist of a single board in width. The rebate and stop for the door are formed by nailing a narrower board on the face of the lining, as shown in Fig. 111. 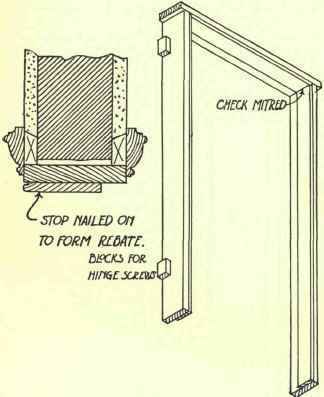 The soffit lining is usually simply nailed across the heads of the jamb linings, and the checks are mitred at the angles as shown in the isometric view. This method is only adopted in common work, however, the proper way being to form the rebate out of the solid, the jambs being got out of stuff sufficiently thick to allow of this being done, while at the same time leaving ample thickness to carry the screws for the hinges, as shown in Figs. 111 and 112. A plan sometimes adopted is that of gluing small blocks of wood to the back of the jambs just where the door binges will come, as in Fig. 111, so that the screws may be driven through the lining into them. When the linings are rebated on both edges, as in Fig. 112, they are termed "Double rebated." The joint between the soffit lining and jamb lining of double-rebated linings is formed by a groove-and-tongued joint. For all walls of 14 inches thick and over, linings should always be "Framed." These may be of two kinds-"Framed" and "Double Framed." 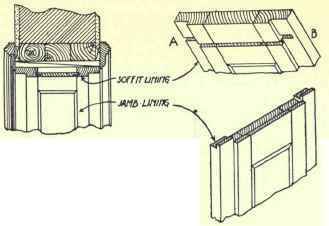 In framed linings the jambs and soffit are constructed of styles and rails, framed together with mortise and tenon joints and filled in with panelling, as shown in Fig. 113. The rebates are formed in the solid on the styles, and the tenons should be "stub." They are fixed together by means of a groove-and-tongue joint, the tongue being cut right across the top end of the jamb and housed into a groove in the soffit. When the work is to be painted the groove is carried right across the rebate, as at A, Fig. 113. In double-framed linings the styles are made up of two pieces, double grooved and tongued, so that the inner piece projects to form rebate and stop. The outer piece is of thicker stuff, and is fixed securely round the opening, so that it will carry doors of any weight, and the inner framing is grooved to it with dry joints, fitted "hand tight," so that in case of any expansion or contraction the inner framing is free to move without in any way affecting the outer pieces. The backs of all framed linings should be painted before fixing, as it preserves the woodwork from damp. 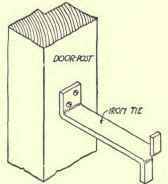 This form of lining, together with the junction between the soffit and jamb, is shown in Fig. 114.